A change of pace now away from temples and shrines. Sumo, one of Japan’s oldest sports but one of the least know. I love Sumo and I love the history and tradition associated with the sport. There are a few publications written about the sport in English and I would advise anyone interested in Sumo to pick one up. According to Japanese legend the very origin of the Japanese race depended on the outcome of a sumo match. The supremacy of the Japanese people on the islands of Japan was supposedly established when the god, Take-mikazuchi, won a sumo bout with the leader of a rival tribe. 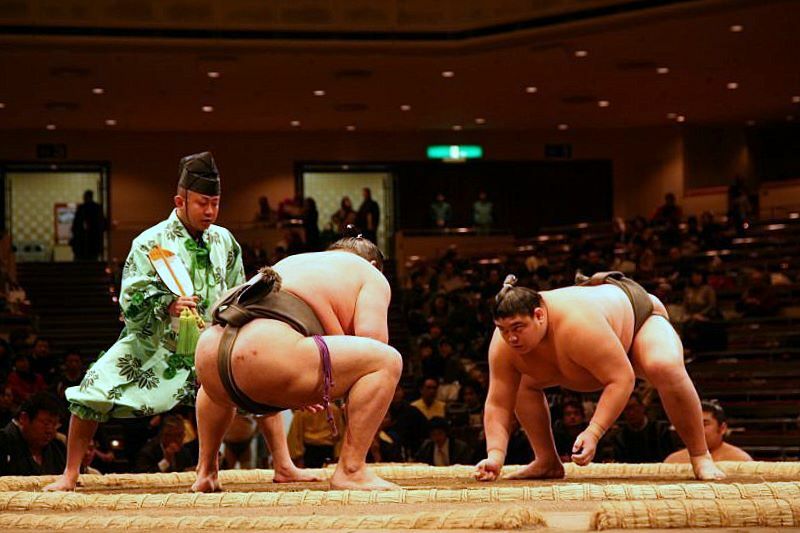 Apart from legend, however, sumo is an ancient sport dating back some 1500 years. Its origins were religious. The first sumo matches were a form of ritual dedicated to the gods with prayers for a bountiful harvest and were performed together with sacred dancing and dramas within the precincts of the shrines. 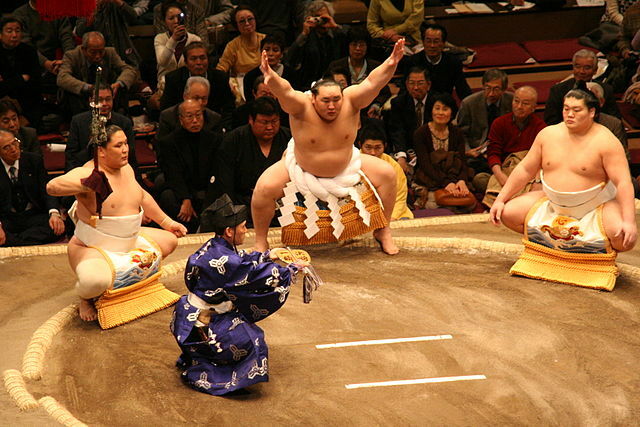 The Nara Period（The 8th century）sumo was introduced into the ceremonies of the Imperial Court. A wrestling festival was held annually which included music and dancing in which the victorious wrestlers participated. Early sumo was a rough-and-tumble affair combining elements of boxing and wrestling with few or no holds barred. But under the continued patronage of the Imperial Court rules were formulated and techniques developed so that it came more nearly to resemble the sumo of today. A military dictatorship was established in Kamakura in 1192 and a long period of intense warfare ensued. Sumo, quite naturally, was regarded chiefly for its military usefulness and as a means of increasing the efficiency of the fighting men. Later in the hands of the samurai, jujitsu was developed as an offshoot of sumo. Peace was finally restored when the different warring factions were united under the Tokugawa Shogunate in 1603. A period of prosperity followed, marked by the rise to power of the new mercantile classes. Professional sumo groups were organized to entertain the rapidly expanding working class and sumo came into its own as the national sport of Japan. 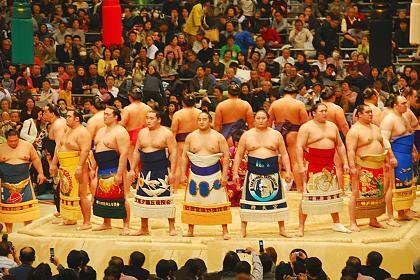 The present Japan Sumo Association has its origins in these groups first formed in the Edo Period. Ancient Sumo pictures are usually portrayed through Ukiyo-E wood block prints such as these shown above. Not quite sure of the date of this picture but I would guess it is in the Meiji period considering the dress of the people in the background. rikishi wearingkesho-mawashi or ceremonial aprons. These aprons, beautifully made of silk, richly embroidered with different designs and hemmed with gold fringe cost anywhere from 400,000 to 500,000 yen. The rikishi climb into the dohyo and go through a short ritual ancient in sumo tradition after which they depart to be followed by the other team entering from the opposite aisle to repeat the ritual. Earlier in the day the juryo perform a similar ceremony before their matches. The leading roles in the dohyo-iri are reserved for the yokozuna who have not taken any part in the ceremony up to now. A yokozuna comes down the aisle attended by a senior gyoji and two maku-uchi rikishi in kesho-mawashi one bearing a sword. Over his kesho-mawashi the yokozuna wears a massive braided hemp rope weighing from 25 to 35 pounds tied in a bow at the back and ornamented in the front with strips of paper hanging in zigzag patterns. This is a familiar religious symbol in Japan. It can be found hanging in Shinto shrines and in the home over the “shelf” of the gods where offering are made at New Year. While the gyoji and two attendants crouch in the dohyo,the yokozuna performs the dohyo-iri ceremony with the greatest dignity. After first clapping his hands together to attract the attention of the gods, he extends his arms to the sides and turns palms upward to show he is concealing no weapons. Then at the climax he lifts first one leg to the side high in the air, then the other, bringing each down with a resounding stamp on the ground symbolically driving evil from the dohyo. After he has attendants the other yokozuna enter, in turn, and repeat the ceremony. time to work themselves and the spectators up to the proper pitch of excitement. to note that it was not until recently that a time limit was fixed. 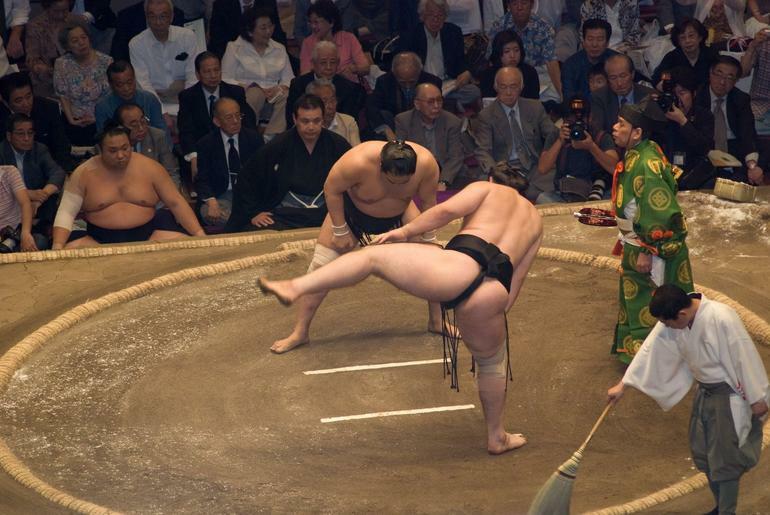 In early sumo the start of a match could be delayed indefinitely. A ten minute limit was first introduced in 1928, later reduced to seven, then to five down to the present four minutes. The bout, itself, is usually over in a matter of minutes, sometimes seconds, less time than it took for warming up, but for the sumo aficionado those brief moments are packed with thrills.